It's not a sweet-sounding custom made turkey call, expensive shotgun, or weeks of scouting. It's patience. Turkey calling has become a sport in itself but there are a lot of turkey hunters who are quite skillful at luring in gobblers in with a variety of calls. You don’t have to have the expensive handmade custom calls but a simple $20 push button type will let you give some of the biggest gobblers a ride in back of your truck. A hunter may be reluctant to call to a turkey, but the push button, slate and box calls are relatively simple to use and you do not have to be a professional to call in a big tom. Some turkeys as well are also mediocre at making their own sounds. I've listened to hen yelps and purrs that were so bad sounding that I thought I was sure they were being made by an inexperienced hunter. If you will hold tight where you are setup and be patient, you will be very surprised as what is just through the brush making those off key sounds. 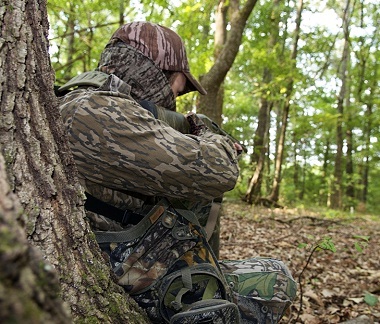 Many turkey hunters can't ignore a gobbler sounding off a half-mile away. They use the "run and gun" tactic to try to pin down the bird, and often end up spooking a wary turkey that is on the way to your calling. It's not necessary to jump up and run to the gobbling tom, I do a lot of filming while hunting Osceola and Eastern wild turkeys. The best way I found is to set up a ground blind in an area where I know there are some birds; a location I have previously scouted and where I know the lay of the land. With a ground blind I can hide my gun, camera and keep down on the movement while calling. I quickly learned that to get the best film, I needed to stay put and be patient rather than walking several miles every morning. I want the hens and gobblers to hang around for a while and a ground blind that keeps you hidden does not alarm the birds and lets them stay calm and to stay within range of a camera, bow or shotgun. I have learned over the years to be patient and wait rather than make a move and risk alerting birds and not filming or harvesting a mature gobbler. If you have to cover large portions of ground at a time on big pieces of property, either scouting or hunting, you will have all types of game on the run. With today’s technology of game cameras and different scouting systems, you can scout several different areas on your property and not worry about spooking game and have minimal traffic leading up to hunting season. With the spring turkey seasons coming up and some already underway, if you will use these simple steps you will have multiple opportunities to give that big tom a free ride in your truck this year: I am a firm believer that patience kills turkeys. If you watch the hunting shows on television, you can learn tactics and techniques, but you should know that the gobblers don't come running on a string when they hear a call or see a decoy. The TV shows may invest a week to ten days of hard hunting just to get the few minutes of turkey action that you watch. Relax, take your time and be patient. Wild turkeys are just about everywhere in the US now, so finding gobblers is not the key. Learning the lay of the land and doing your homework is critical. If there is a fence, creek, farm house or highway between you and the gobbler that sounds off at daylight, it can possibly block the bird from coming to your call. Rely on your own instincts, be patient and do what makes sense to you; if you don’t think it is a good idea, then it’s probably not. Ben Busby hails from south Alabama and has always had a passion for turkey hunting and the outdoors. He serves on his local NWTF committee and is currently working on my Grand Slam. Ben has a passion for introducing new hunters and youth to hunting. He is on the film crew for The World of Outfitting website and loves to travel as much as possible to hunt wild turkeys.